I recently contributed a short essay to the Land Diagrams web project at the invitation of Amy Cutler. In partnership with another commentator we were set to think about the meaning of map of linguistic data for Cornwall suggested by Amy. The goal of Amy's project to produce ‘twinned study’ that can "offer two simultaneous gestures of thought in response to one geographical image". 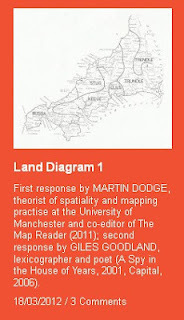 I hope the Land Diagrams project develops and I'll be keeping an eye on it.